As China continues to rapidly transit to smart shared services, continuous improvement, customer experience, value-added services and high-end technology implementation remain on the top of the agenda of industry leaders and practitioners. In addition, the “One Belt One Road” & “Internet+” National Plan has provided China bountiful opportunities for technology implementation, international talents sourcing, government cooperation, and globalization. Coupled with rising cost and talent constraints, it has become imperative for shared services leaders to leverage on high-quality talent and innovative technology including machine learning, RPA, AI and data analytics. 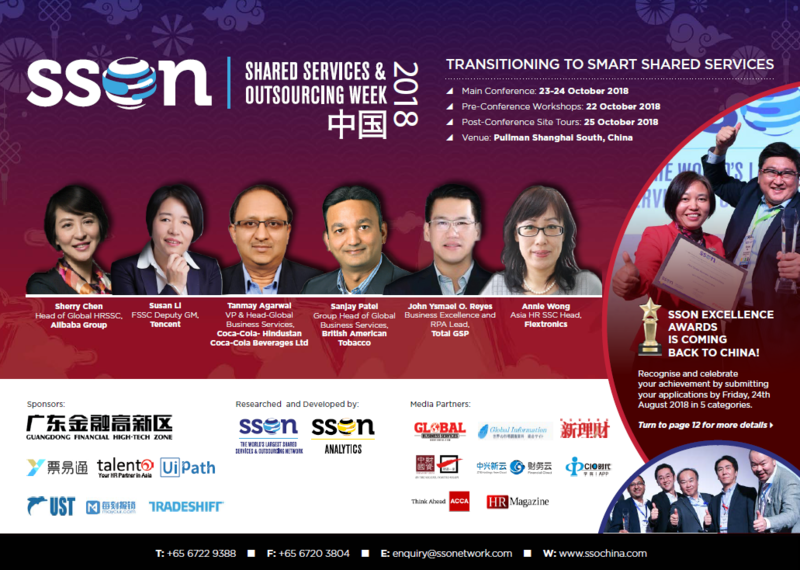 The 7th Shared Services & Outsourcing China Week is back and will be held on 23-24th Oct. Save the date on your calendars and join us at the largest China SSO event bringing all the industry practitioners together in one single platform.